This is the second instalment of my set of 3 videos going over a number of the questions I have been getting over the last couple of weeks. If you haven’t already read part one or watched the video for part one then you can go to Local SEO Optimisation Part 1 to check it out. Again for those who learn better by reading I have expanded the video for you below. If you have any questions then feel free to drop me an email and I will do my best to get back to you asap. 5. Are you aware of what your competition is doing to rank online? Knowing how much your competition is spending on adverts, the keywords they are targeting and the effort they’re taking can all be tracked with online tools. All of the tools do cost a monthly fee but you can usually get to use them four or five times a day for free. One of the online tools that can be used to anlayse your competition is Semrush.com. Semrush can give you great insights into what your competition is doing. If you don’t already know who your online competitors are then simply type into Google the keyword you want to target, then find your competition from the top 10 displayed. Look for the websites that look like a local business and they that are not directory sites like Yelp, Yell etc. 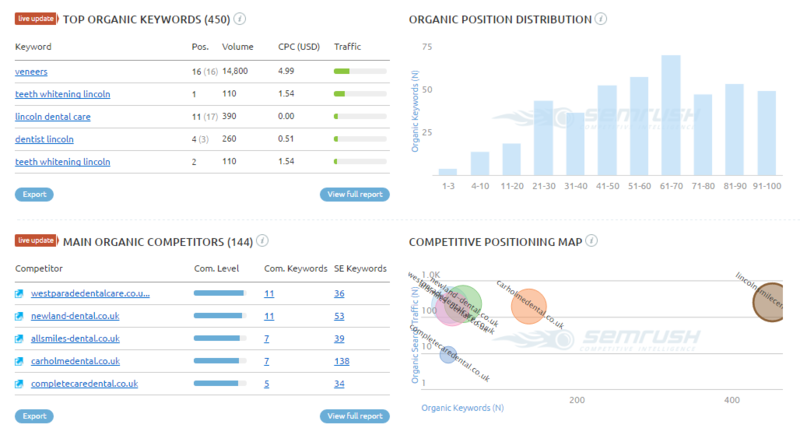 Once you have a list of your competitors then put each one of them into Semrush.com to analyse them. You will be able to see how much traffic they are getting organically, (through the search engines), what traffic is being sent by paid adverts (adwords), the backlinks they have and two graphs showing the traffic over time and where the traffic is coming from. You can also see the keywords that they are ranking for and their competitors, which will also be your competitors. 6. Is your website optimised properly? There are lost of different factors that Google looks at to determine your positioning in the Search Engine Results Pages (SERPS). As Google’s bots are computer programs they can only tell what you are wanting to rank for by the contents on your website. 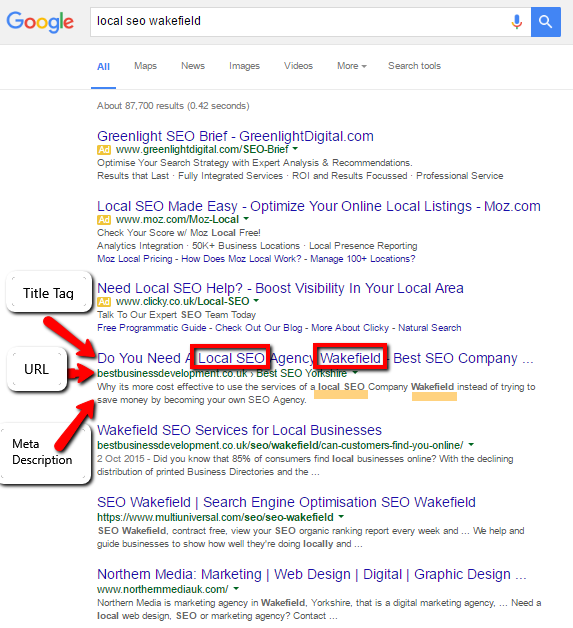 In the image below you will see that I am using the search term “local seo wakefield”. One of the main properties that Google looks at to decide on what your web page is about is the Title Tag. The title tag is the first line that is shown when you do a search for a keyword. The next line down is the URL of the page and then the meta data or meta description. Google looks at all three when trying to establish what a page is about. You will see that in my title tag I have the words “Local”, “SEO” and “Wakefield”, and then in the meta description I also have the words “local”, “SEO” and “Wakefield”. Even though it has a word in between, Google can still pick out that those 3 words are in the title and the meta data. If you look at the next result down you will see that I have “Local”, “SEO” and “Wakefield” in the title and “SEO” and “Wakefield” in the URL but only “Local” in the meta description. Still enough for Google to know what my page is about. You don’t always have to use the exact keyword either Google’s bots are intelligent enough to know that the term on number 4 “locally” is the same as local. Google is simply an open book, every time you type in a search term Google tells you exactly what it is looking for. So all you have to do is see what your competitors are doing and then optimise your site slightly better than them and you will be on your way to getting onto page one. As a test try it for yourself. Choose a search term, type it in and then check each of the top 10 sites and see how many have the words in the title, and how many have it in their meta description as well. Now check your site. Do you have the search term or variants of it in your title tag, URL or meta description? If not change it and see what happens. Each page of your website should target a specific keyword or group of related keywords and therefore the title tag and meta description should be different for each one. In wordpress this is easy to change. I use a plugin called All In one SEO which makes it really easy. If you have a web designer then you might need to tell them what you want as the title tag and the meta description for the page as sometimes web designers don’t understand local SEO properly and will either leave them blank or just cut and paste some text from the page into it. If your title tag or meta description are left blank then Google will simply pick a line of text and a sentence from your page to populate them on the search pages. Keyword Density – Don’t Overdo It. One of the other on page factors that Google looks for is keyword density, or how many times a keyword or key term is on a page. 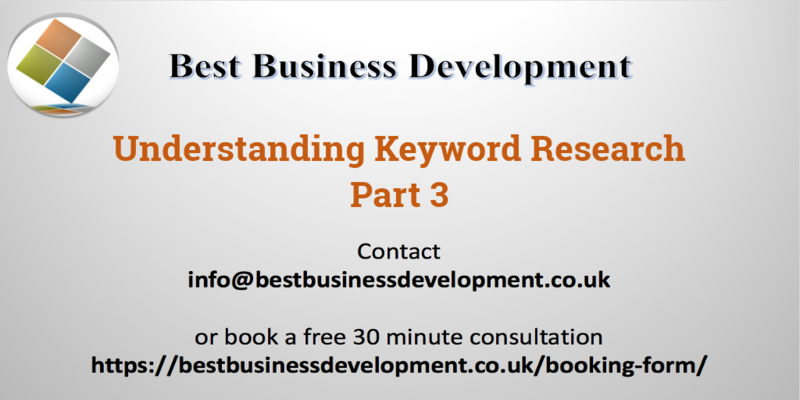 Keyword density is a whole topic in itself which I will cover later. But for now if you just think about keeping your keyword density to what looks natural. I.e not having the term “local seo wakefield” hundreds of times on the page, as that would not be natural. I would probably only have it once or twice as the full term. The term local seo could be on a few more times and then the word wakefield on its only could be on a few more times, as long as it fits in with the context of the text. 7. Is your contact information easily found? Is your telephone number, email address in a prominent position on every page? As the majority, at the last research over 60%, of people search on their mobiles. They don’t really like scrolling around and searching for your phone number or email address. If they can’t find it easily they will simply go to one of your competitors. Also make sure that your phone number is not just easily readable but also clickable so that people on mobile phones can simply click the number to call you. You can also make your email address clickable as well to make it easier for people to contact you, especially on mobiles. As with the title tags and meta description this is something that you might have to have a word with your web designer about. Also make sure you have full details on your contact page, Name, Address and Phone Number (NAP). Wherever you have your NAP it must be consistent as to what is on your Google business page. This is the same whether it is on your site, for all of your social networking sites, citations and directory listings that you have. Create your Google business listing first and then using the NAP as Google displays it, set up the rest of the sites. 8. Do you have a video embedded on your website? Visitors watch video that is a fact. Video keeps people on your site for longer which is one of the other ranking factors that Google looks at. How long are people staying on your site and what interaction are they having. You do not need to be a professional videographer with top of the range cameras to create a simple video for your site. You can create various types of videos depending on your business type from explainer style videos, simple powerpoint videos, product shot videos and demo videos. The other good thing about video is that it gives you another property to get onto page one for the keywords selected. If you want to be kept informed when we have any new posts or videos then feel free to join our mailing list below.